The International Franchise Expo in June drew crowds from over 100 countries around the world. 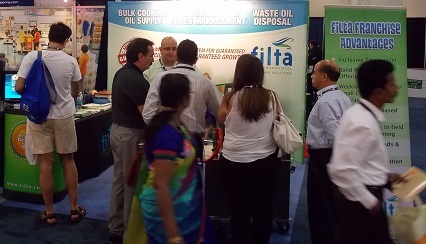 Filta was proud to share our franchise vision with the attendees and we were honored to be so well received at this extremely successful show. We presented a bold vision for growth throughout the Northeastern United States including franchises in New York, New Jersey, Connecticut, Pennsylvania, and New England. In addition to expansion within the US, we have plans for future growth in Central and South America. Between the booth and the Filta van at the venue entrance, we received a lot of traffic at the expo. 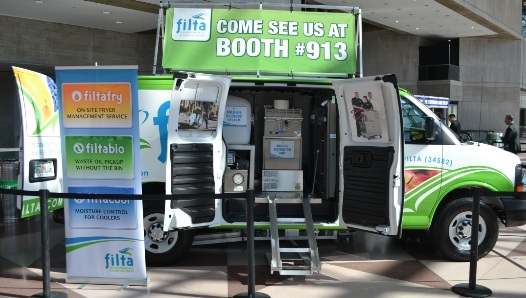 Filta has had a successful business since 1996, making it easy for franchises to duplicate their success. There are three things a potential franchisee must have in order to guarantee success. You will need to be able to follow a proven system that Filta has perfected over many years. You will also need to have the ability to sell these services to area businesses, or the ability to hire and manage someone to sell these services for you. Lastly, you will need some capital to get the business started on the right foot with proper equipment, supplies, and marketing. To make the process even easier, Filta offers special incentives for honorably discharged veterans, international franchise resale opportunities, and home based franchise options.